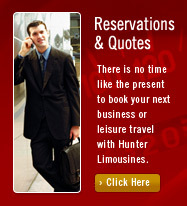 Hunter Limousines Ltd. prides itself in its ability to assist its clients with all of their transportation needs. We create an atmosphere that allows our clients to relax, whether it is on the way to an important conference, last minute flight, or something as special and personal as their own wedding ceremony. Hunter Limousines Ltd. will impress you with our skilled and personable staff of chauffeurs and our impeccable fleet of luxury automobiles. Our reputation for celebrity transportation and business travel is one of prompt response and impeccable service. Whatever the occasion, Hunter Limousines offers a variety of transportation packages including custom packages so that you truly can get to any destination in style. Connecticut limousine and shuttle services.